Dr. Raja H. Ataya, a Beaumont-based pediatrician, holds a family portrait in his office in Beaumont on Friday, July 14, 2006. The Lebanese immigrant is concerned about the safety of his wife and daughter who were vacationing in Beirut when Hezbollah kidnapped and killed Israeli soldiers. On Tuesday morning, Beaumont residents Sousan Ataya and her daughter Ramona, 22, were vacationing with family in Beirut, Lebanon. With soaring mountains, cedar trees and memorable golden beaches along the Mediterranean Sea, the city is known as the Paris of the Middle East. By Friday, they had evacuated to their mountain home, were scared, unsure what action to take and were surviving in a house with 50 other evacuees. Scores of civilians had died, many more were injured, the airport was hit and closed, roads were bombed, power plants had been destroyed and communications throughout the country were cut. Dr. Raja H. Ataya, a Beaumont pediatrician, gave the vacation to his daughter as a gift before she begins medical school at the University of Texas Medical Branch this year. He's concerned about the safety of his wife and daughter. "We've been in Beaumont for 22 years. Beaumont is now my hometown, but I came from Lebanon," Ataya said. "I haven't been to Lebanon for eight years. My daughter told me, 'Dad, I want to see Lebanon. Every year you delay that.'" "So I told her, 'This is the best year to go to Lebanon.' Unluckily, we selected the wrong time," he said. "Five days later the war began, and they're stuck there." According the blog The Lebanese Bloggers, at 9:05 a.m. local time on Tuesday, July 22, 2006 Hezbollah guerrillas crossed the Israeli-Lebanon border, killed three soldiers and kidnapped two others. Then, Hezbollah announced what they had done and issued demands for a prisoner exchange. This announcement politically eliminated an initial diplomatic solution. At 10:30 a.m. local time, Israel responded. Initially, Israel contained its military activities to the southern portion of Lebanon. When the captured soldiers were not returned, Israel struck the airport as well as other routes of resupply from Syria to the Iranian-backed Hezbollah guerrillas on the Israeli border. The Consulate General of Israel to the Southwest office in Houston, Beaumont's Temple Emanuel and the Beaumont Jewish Federation were all contacted. None responded after repeated requests for interviews. "Beirut city was recovering, hotels, businesses. It was booming with success," Ataya said. "After 20 years of civil war, everyone was so excited about it. Things were getting better and then suddenly Hezbollah and Israel have this confrontation. Beirut changed in 24 hours and became a shadow of a city." The state of Israel was created by the United Nations in 1948. It was immediately attacked by five surrounding Arab states. Israel won the battles and gained additional property not mandated in the United Nations resolution. The surrounding Arab nations also kept land formerly belonging to Palestine. The Palestine Liberation Organization (PLO) was created in 1964 during a summit meeting of the Arab League. The PLO was an umbrella group for Palestinian concerns. It was originally based in Jordan. After repeated attacks into Israel by the PLO and the subsequent damage inflicted by Israel upon Jordan, Jordan and the PLO engaged in a short war. Afterward, the PLO fled to southern Lebanon. The Six-Day War took place in June 1967. According to MSN Encarta, Israel conquered Egypt, Jordan and Syria to claim the Sinai Peninsula, Gaza Strip, West Bank and the Golan Heights. Parts of all but the Golan Heights, which formerly belonged to Syria, were negotiated for peace. Abbie Baradar is owner of Abbie's Imports in Beaumont. Baradar left Iran in 1969 while the Shah was in power. He knows Ataya and sympathizes with the troubles facing the family and the country. "The sad situation is that Lebanon is some kind of neutral country," Baradar said. "Around the 67-69 war, [instead of] Syria fighting in their own country, they went to Lebanon and [fought] the Israeli in Lebanon. Lebanon didn't have an army. Lebanon is a beautiful country." The PLO continued to conduct raids into Israel from Lebanon. Again, Israel fiercely responded against the PLO in Lebanon. This lead to the Lebanese Civil War (1975-1990), largely fueled by Israeli and Syrian invasions into Lebanon. "Why does Lebanon have to be the stage for this," Ataya said. "We suffered enough. We had a civil war. We lost 200,000 people. Why do we have to suffer now. I appeal to President Bush ... [to] help put an end to this because Lebanon is like another [American] state." On June 6, 1982, Israel forces invaded southern Lebanon and eventually surrounded West Beirut. With the help of international peacekeepers, Syria and PLO fighters negotiated safe passage out of Lebanon. The damage to Lebanon's infrastructure was estimated to cost about $2 billion at the time. Many believe this Arab defeat caused the creation of Hezbollah, which was funded by and ideologically aligned with the Iranian government following the 1979 Iranian Revolution. "OK, there is the Palestinian suffering," Ataya said. "The Palestinians are paying a price too high. Why we - the Lebanese - have to do the same thing. We're not part of the problem." "We're still Arabs and sympathize with the Palestinians. We're asking Israel, 'OK, you have a problem with Hezbollah, so your confrontation should be with Hezbollah.' [Don't] sacrifice the whole [of] Lebanon because of what Hezbollah is doing and we're not responsible for its acts," Ataya said. Hezbollah was created and funded by Iran in 1982 according to Time magazine. It is a Shiite Muslim militia. It filled the conflict vacuum created when the PLO was forced out of Lebanon. "Right now it's the same thing again," Baradar said. "Hezbollah is there and that country is going to go down again. Syria's going to fight in Lebanon and that's going to mess up their country again. And Lebanon has nothing to do with anything." Hezbollah has been building arms since the end of the last conflict with Israel, which ended in 2000 when Israel withdrew from a Lebanese "security zone" in accordance with UN Security Council Resolutions 425 and 426. "We are stuck in the middle because this Lebanese government was really trying to be independent of Syria and Iran," Ataya said. "For the first time, they got open to the West, the USA, and relations so beautiful - so grand. Business has been encouraged for U.S. investors to come to Lebanon." "I know Hezbollah has triggered Israel by capturing two soldiers, but it's a confrontation between Israel and Hezbollah. Why the Lebanese people have to pay the price?" he asked. Hezbollah's continued campaign against Israel's northern flank has been interpreted as an extension of Syria's desire to reclaim the Golan Heights, according to the Web site Palestine Facts. "Probably Hezbollah planned this to do it anyway. But why?" Ataya asked. "Lebanon has its peak of business, success and happiness and people in Lebanon came from all over the world to enjoy this time." "Hezbollah knows more than anyone else that Israel has no bargaining there. And [Hezbollah] knew that it was going to devastate Lebanon and hit Beirut," Ataya said. "But Hezbollah doesn't care for Lebanon. They care for like the Palestinian cause, 'It doesn't matter where we are. If destruction happens, that's fine. We are defending the Palestinian cause.'" It took 20 years and billions of dollars to rebuild Lebanon to where it was before current hostilities. "If you defend Palestinians from Lebanon, what kind of achievement do you plan? You can defend the Palestinian cause without exposing Lebanon to that fight," Ataya said. "Our goal is Hezbollah has to be dissolved - respectfully - and be part of the Lebanese army. Lebanon, like other independent countries - like Syria and Iran, we don't like to be a stage for their political activities and for making plans to attack and defend the Palestinian cause just in Lebanon," he said. Meanwhile, approximately 25,000 Americans remain in Lebanon amid the bombings. The U.S. Department of State is urging American citizens to defer travel to Lebanon on its Web site. It has issued a travel warning authorizing family members and non-emergency American employees to leave Lebanon. Friday, Sousan Ataya called the American embassy. She was told "Stay where you are. When we have plans for an evacuation, we'll let you know." 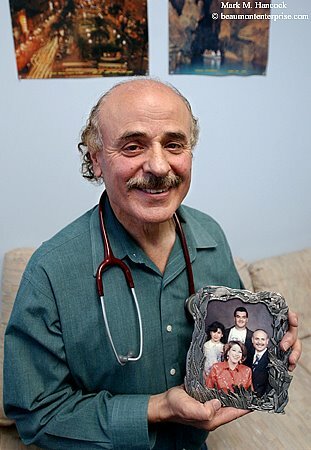 Dr. Ataya said Ramona told him she loves the beauty of the mountains in Lebanon, but she wants to get out of Lebanon. "I don't know how, but they'll get out. Don't worry. The U.S. Embassy is trying," he said. The Lebanese Bloggers: Lebanese bloggers update a blow-by-blow log of violence from the inside. Palestine Facts: Site features a cross-referenced history of Palestine. UPDATE 7/26/06: Please see Ataya family reunites.